Breakfast was standard. Lon ate another one of those chocolate almond pastries but I resisted the platter of donuts. Santorini was by far my favorite stop, which is no surprise. Everyone raves about it and it is truly wonderful. Our boat anchored out in the water. We boarded tenders to get to shore, where we road the cable cars up the steep mountain side (while watching others ride donkeys up the mountain), arriving right in Fira, another touristy town. We decided to rent a Go Cart-like four wheeler to see more of the island in the few hours we had. 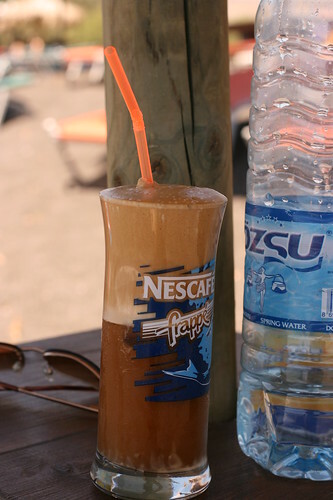 First stop would be the famous black beach, Perissa. We got a little lost even though there’s only a handful of roads on Santorini. 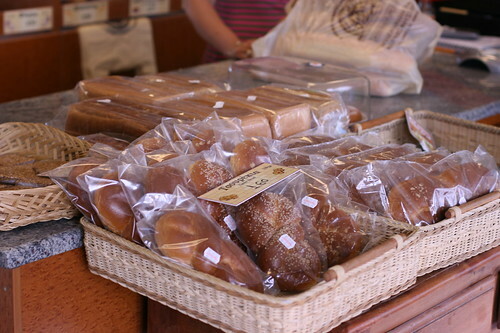 The good thing is that we found an area free of tourists where we stopped at a bakery. 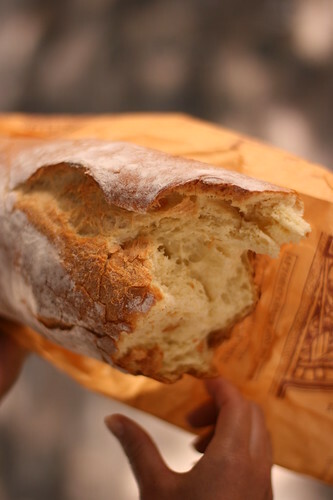 As soon as you entered, there was an amazing aroma of fresh baked breads. The shop was full of local restaurateurs picking up bread for the day. We bought two to try and we headed out. I went to look for a bathroom and by the time I got back, Lon had eaten half the loaf (about 2 feet long). I ate the other half as we drove towards the beach. It was crunchy and crusty on the outside, soft on the inside, and warm, having just come out of the oven. The black sand beach is lined with cafes, with umbrellas and beach chairs (which you pay to use). The black sand looks a little like black sesame seeds and gets painfully hot, so I didn’t really move off my chair. I ordered a frappe as suggested by an anonymous comment. They have been all over Greece so I was very excited. It looks great but tastes just ok. I like that you can order it just moderately sweet but I thought it was a bit acidic. We drove all the way to the other end of the island to have lunch at Sunset Taverna in Ammoudi Bay. A few locals claimed that it is the best restaurant on their island and it exceeded our expectations. First of all, it started with great bread, something that hadn’t happened at any of the Greek restaurants yet. 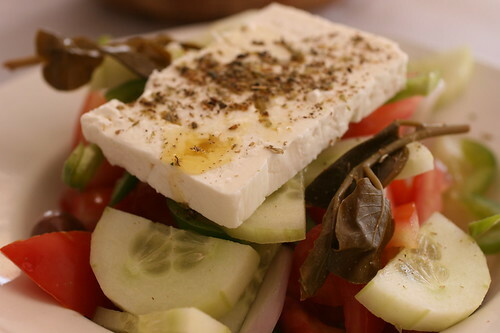 The Greek Salad (with those wonderfully sweet raw onions) had great capers and olives, but the rest was average. The Lobster Spaghetti (which the waiter said they are known for) was the best lobster and/or pasta dish either of us have ever had! The roughly 2 pound Spiny Lobster (which we saw alive before it was cooked) was so tender and naturally sweet. The pasta was flavored with a uniquely delicious sauce that we tried to figure out. 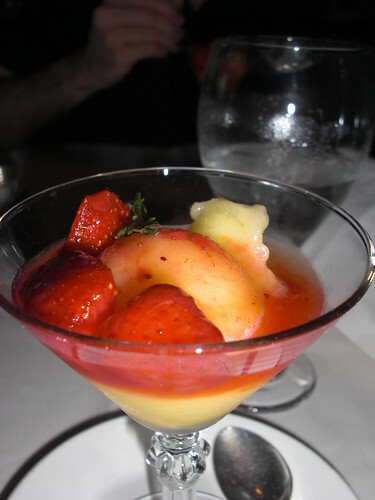 It was definitely made with lobster stock and lobster roe, which made it so rich and decadent. The aroma of onions, garlic, and maybe scallions. The tang of a bit of tomato and some orange. Lon asked about an herb that the waiter said is close to oregano (looks a little like seaweed). We stuffed ourselves, determined to eat as much as possible of it, since we would likely never have it again. On top of being such a memorable dish, the view was perfect. Sunset Taverna was embedded in the mountainside, right by the water, where we watched boats bob in the clear blue water. I was so sad that our time was so short here. Right after lunch, we had to rush back to our ship, where we sat on our balcony to snack on the Easter bread we bought at the bakery earlier. It looked so good but it was dry and we didn’t finish it. This evening, the dining room was serving the Chef’s dinner, which was satisfactory but not that impressive. 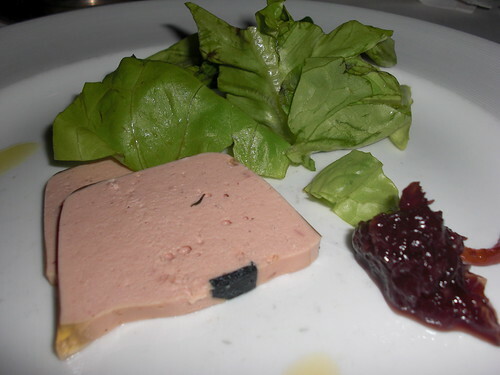 The Quail Terrine was pretty good, nicely balanced against the preserves, but not something I’ll miss. The salad, which was labeled Boston Lettuce Salad didn’t actually have any Boston Lettuce in it. 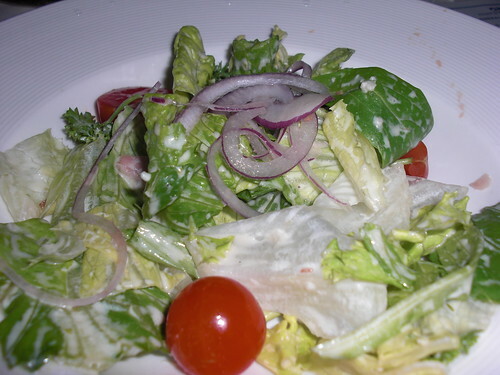 Generally, salads have been boring anyway and this one was no more exciting, just romaine, onions, and cherry tomatoes. The intermezzo sorbet course was too sweet for me. 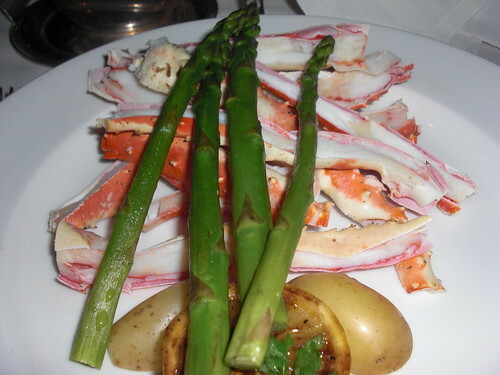 We both had the crab legs, which were pretty standard, along with standard asparagus, and a waxy potato. 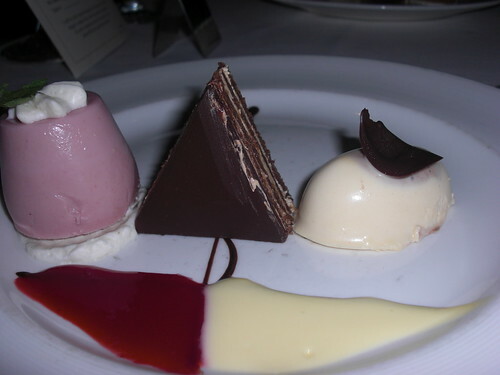 The dessert trio included a raspberry mousse (colored so I didn’t try it), a standard chocolate and coffee cream cake, and a pretty good peanut butter panna cotta. 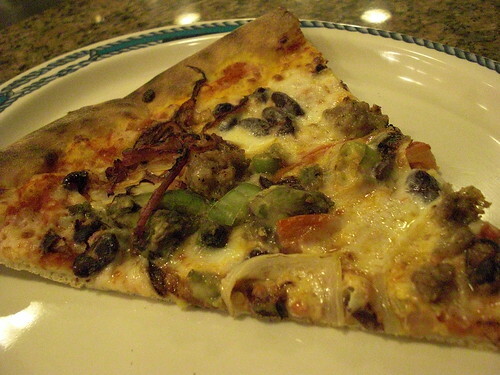 Lon grabbed a Mexican Pizza (beans were al dente which was weird on pizza) before heading over to the Cosmopolitan Buffet where nothing looked appetizing. I did try the miso and tofu soup that had no miso but did have some mushrooms. It was salty and generally uninteresting. ery night. We sat on the lounge chairs with the blankets they provided, and of course, we were eating. 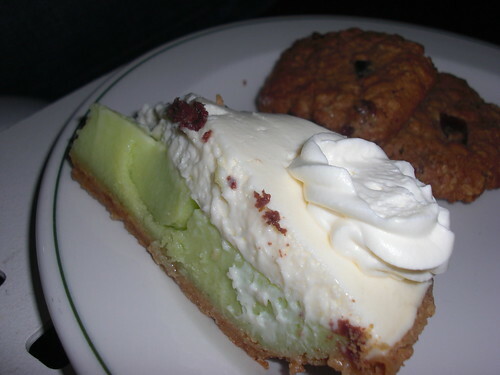 Lon picked up a Key Lime Mousse Pie (not so good) and cookies from the buffet. 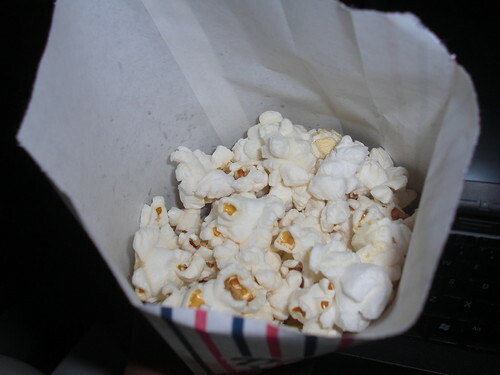 Staff handed out stale popcorn, which I ate anyway, possibly just a reflex while watching a movie. It was an exciting day and relaxing evening, probably the best day of this trip. posted by jessica	at 09:51 PM	Filed under Favorites, Mediterranean, Restaurants, Travel. You can follow any responses to this entry through the RSS 2.0 feed. Both comments and pings are currently closed. I’m so happy that you guys found something that was really good! Finally right? -=) The movies under the stars thing sounds so romantic! Yay! A good food day. 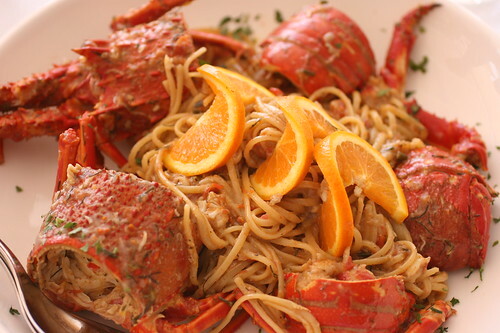 My mouth watered thinking about your lobster dish. Knife, I’ve tried telling my dad that but he sticks to eating hockey pucks. Thanks Wonders, it was scrumptious. Thanks Ellen, we’ll probably try to replicate the dish, but it will never be the same since we don’t have spiny lobsters here.